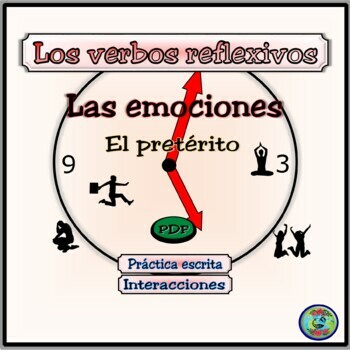 Reinforce reflexive verbs of emotion and well-being with these easy practice worksheets (2nd year and abovel language learner levels, Immersion and Heritage speaker). All activities and worksheets can can be modified for teacher-guided, individual, group or whole class activities. Students may need to reference a thematic vocabulary reference or their textbooks for the definitions of the reflexive vocabulary. (Approximates novice-intermediate level of the World-Readiness Standards For Learning Languages). Extra practice in a simple format. Sometimes you just need a quick worksheet for those substitute days without the extra preparation time. File it away in your teacher toolkit by topic for when you just need a quick change of pace. Reactions and Emotions Worksheet can be purchased individually as a stand-alone activity. If you would like additional activities to supplement your current daily routine and reflexive verb curriculum, please see my other related resources below. Maestra Mapache Creations has coordinated these collections of vocabulary, dialogues, worksheets and images to be your versatile tool for both verbal and written activities. Put your valuable time back in your hands.